OVERLAND PARK, Kan. -- An elderly man opened fire Sunday at two Jewish facilities in suburban Kansas City, killing a doctor and his teenage grandson and an elderly woman before he was taken into custody, authorities and witnesses said. The suspect was shouting anti-Semitic slogans as he was arrested, CBS affiliate KCTV reported. KCTV's Bonyen Lee also reported that the suspect appeared to yell "Heil Hitler" as he was taken away. The shootings occurred a day before the start of Passover, the eight-day holiday in which Jews commemorate their liberation from slavery in Egypt more than 3,300 years ago. CBS News has confirmed the suspect in custody is Frazier Glenn Miller, 73, of Aurora, Mo., also known as Frazier Glenn Cross. The Southern Poverty Law Center said Miller is a "raging anti-Semite" who is a former "grand dragon" of the Carolina Knights of the Ku Klux Klan. Miller has posted more than 12,000 times on Vanguard News Network, whose slogan is "No Jews, Just Right," the civil rights organization said. Police Chief John Douglass told the reporters the suspect was a man in his 70s who was not from Kansas and was not previously known to local authorities. Douglass declined to say whether the suspect made any anti-Semitic comments. "The suspect in the back of the car made several statements and we are are sifting through and vetting those for accuracy," the police chief said. "It is too early to tell you what he may or may have not said." Douglass said it would be premature to declare the shootings a hate crime. President Barack Obama expressed horror at the shootings and said he had instructed his aides to make sure local, state and federal authorities have all the resources they need for the investigation. "While we do not know all of the details surrounding today's shooting, the initial reports are heartbreaking. I want to offer my condolences to all the families trying to make sense of this difficult situation and pledge the full support from the federal government as we heal and cope during this trying time," he said in a statement. A city spokesman said two people were killed at the Jewish Community Center of Greater Kansas City and one was killed at Village Shalom, a retirement community several blocks away from the community center. The first shooting occurred about 1 p.m. in the parking lot of the Lewis and Shirley White Theatre on the Jewish Community Center campus, according to an Overland Park Fire Department spokesman. About 75 people were inside the theater at the time, most of them children, KCTV said. Teens were auditioning for KC SuperStar, a singing competition for high school students, and actors were also rehearing for a production of "To Kill a Mockingbird." Frantic parents tried to get to their children as news of the shooting spread. The second shooting incident occurred at Village Shalom, an assisted living center in Overland Park that has been in the community for more than 100 years. 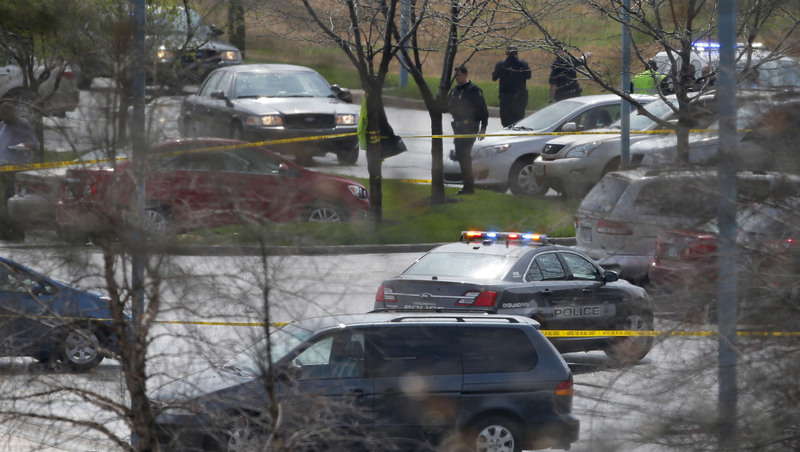 "He was asking people whether they were Jewish and then he shot them," Rabbi Mandl said. Douglass said a total of three people were killed. Two other people were shot at but were not hurt. Two male victims were shot in a car at the parking lot outside the Jewish Community Center. Family members identified them as Dr. William Lewis Corporon, who died at the scene, and his 14-year-old grandson, Reat Griffin Underwood. The high school freshman, an Eagle Scout, was rushed to a local hospital but died of his injuries, the family said. "Dr. Corporon leaves behind his wife of 49 years and a loving and devoted family and extended family," a family statement said. He was "a well-loved physician" who "cherished his family and more than anything had a passion for caring for others." Reat was active in debate and theater and "had a beautiful voice," said the statement released by the boy's uncle Will Corporon. "Reat had a passion for life, and touched so many people in his young age," the statement said. Grandfather and grandson attended the United Methodist Church in nearby Leawood. The church's senior pastor, the Rev. Adam Hamilton, broke the news to church members at a Palm Sunday evening service, The Kansas City Star reported. Although Corporan and his grandson apparently were not Jewish, the shooter could be charged with a hate crime if he targeted him because he thought they were. The third victim was an elderly woman killed at the retirement facility, Douglass and Mandl said. They said her name would not be released until all relatives had been notified. The suspect was arrested in the parking lot of the Valley View Park Elementary School, a mile away from Village Shalom. Douglass said a shotgun was used in the shooting and that the suspect had a handgun as well. He said police were searching the suspect's car, a white Suzuki. The police chief said authorities had received no prior threats to Jewish centers but as soon as authorities received reports of the second attack, squad cars were dispatched to all Jewish facilities in the city. Douglass said it was too early to characterize the shootings or to say whether anyone else may have been involved, but he said authorities believed there was no longer any active threat. "We are investigating it as a hate crime. We are investigating it as a criminal act. I don't want to rule out anything," he said.